Despite having lived in Pittsburgh my whole life, I had never gone to a Phantom Fright Night at Kennywood until this month. I arrived with a friend of mine about an hour after the gates opened. Having tickets printed ahead of time makes check-in a breeze. Be advised: Kennywood enforces a no re-entry policy and a no costume policy during Fright Nights. We were greeted at the entryway tunnel by a few masked actors, one wielding a chainsaw and another wearing a rad fallen-angel costume. The whole tunnel was full of that special-effects fog that lingers heavily, like dew in late summer. The tunnel-o-fog set a great tone, however, the tone wasn’t completely carried through throughout the park. It is worth noting that the Fright Nights are not a traditional “haunted attraction” but rather a Halloween-ification of Kennywood. Some Kennywood spaces are transformed into haunted houses, games are Halloween-themed, and creepy music is pumped throughout the park. Several of the rides and most of the coasters are open as well, which beats a standard haunted house. Like most ventures to amusement parks, you get what you sign up for. Once passed the entryway tunnel, it’s easy to avoid the actors. It’s nice to have control over the method of spooky. However, visitors spend a good portion of the night in lines to be scared before getting in separate lines for other attractions. Or, if my visit was any indication, you spend most of your time figuring out which line goes where and whether or not the line is worth the time. 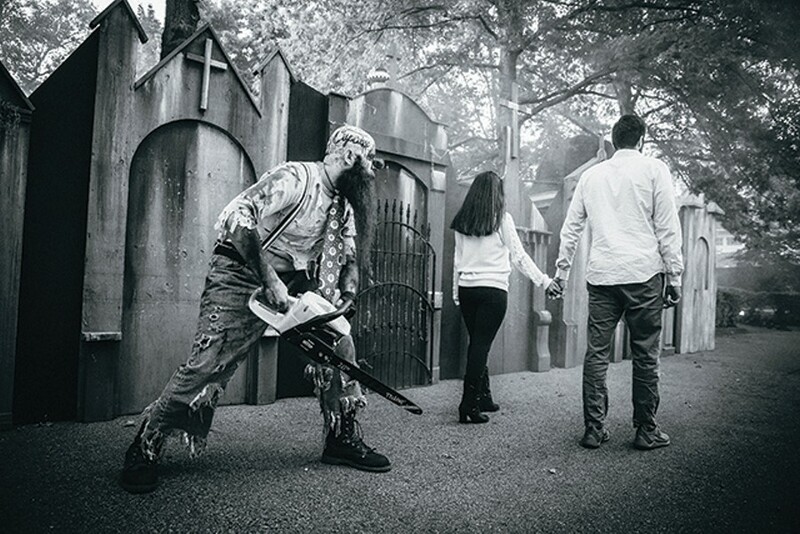 One exception would be Old Kennywood, which has been artfully transformed into “Gory Park.” The themed path comes complete with zombies, a car crash, and some spectacular actors. Kennywood is a sprawling park, and it makes sense that most of the effort is directed toward the haunted attractions scattered throughout the park. But the keyword is scattered: there are parts of the park that aren’t decorated and feel more like trespassing in the off-season than a seasonal attraction. Come prepared and research the attractions. There are so many options of haunts throughout the park, but signage is sparse and nondescript, and I only found out about some of the attractions by referring to a brochure after the fact. Actors do terrorize folks in line for coasters or haunted houses, which is a great touch. While in line for the Jackrabbit some visitors ahead of us were startled by a man in a red flannel scraping some sort of pipe across the fencing. Kennywood’s attention to detail shone through on its rides: the Jackrabbit is completely dark and its tunnel filled with fog. The Thunderbolt, Phantom’s Revenge, Aero 360, Black Widow, Bumper Cars, and Racer are all similarly darkened. Other parts of the park are lit up in hues of orange and purple. Phantom Fright Nights is best experienced as a group activity with people that are good sports and willing to wait in line. Come prepared with some idea of what the group wants to do to make the most of the night. Also, don’t get too thrown by the massive, darkened Christmas tree over by Kiddieland and the wreaths hanging off of refreshment stands. Unless a reminder of the creeping of time is an intentional scare. Now that got me.